Long time, no blog everyone! I hope you are all doing so well. I've missed blogging so much and have lots of goodies to share with you soon & this review is something I've been very excited about. A few months ago, I got in touch with one of my favorite skincare brands and they have graciously sent me a few products to try, including one of my skincare STAPLES! UPDATE - scroll to the end, to get 10% off your purchase on Odacite.com! 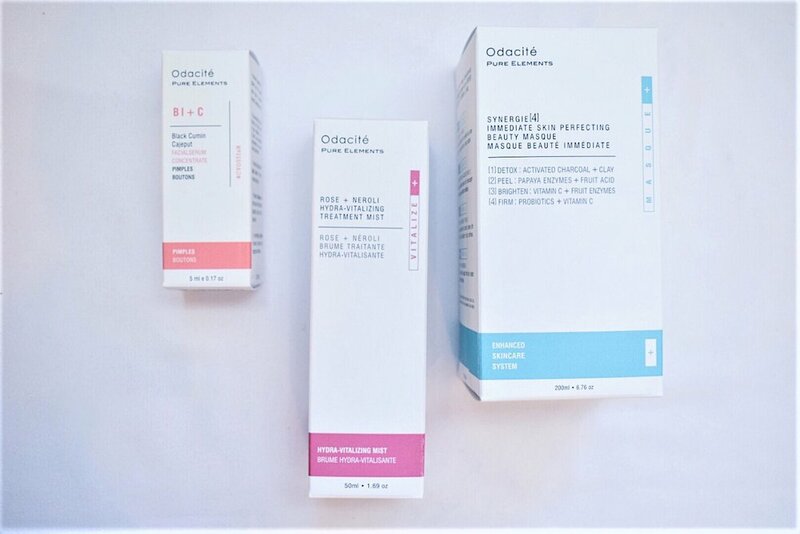 If you haven't heard of Odacite before, it is a California-based, all natural, vegan, cruelty-free skincare brand that caters to multiple different skin types and issues. I found out about them through my purchase of their concentrated serums and my favorite to this day which is the Black Cumin and Cajeput serum (you'll see more about it below). Ever since then, I was hooked. It's one of the things that has helped me keep my acne in check. The masks I tend to use have an exfoliating, grainy texture once washing it off. This is different. The powder formula is SO fine, in fact SO VERY FINE! I was a little hesitant on how much "exfoliating power" it has. Now, this mask claims to do A LOT of things. Just reading the name of the product makes me feel like it's going to perfect all my skin care issues. So what exactly does it claim to do? - DETOX and PURIFY PORES via the clay and activated charcoal ingredients. - Act as a PEEL via the enzyme and fruit acids. So how exactly did the Synergie Immediate Skin Perfecting Beauty Masque work on my skin? The masks I've used previously tend to have a lot of exfoliating properties on top of the skin-detoxifying properties. This mask is different in that the powder formula is SO VERY FINE, so I was a little worried that there would not be much exfoliation. Granted, this is NOT an exfoliating product but usually I end up getting some exfoliation out of my masks. The way I made #MySkinCocktail is by activating the mask with water, and adding a couple of drops of the Black Cumin and Cajeput Concentrated Serum. I ended up putting on a thick layer on my face so it did take longer than normal to dry. Once it was completely dry, I washed it all off and my initial thought was "my face feels so smooth and not dry!" That was the first time I've felt that my skin was not dry after a mask, and was all about it. Now, I don't think my skin was "immediately perfected" as the name states it would do, but using it a handful of times now, I noticed my pores have been more detoxified than ever and my skin seems brighter. I can't wait to see how it will improve my skin over time. There are multiple ways to whip up your skincare cocktail: you can mix it with apple cider vinegar, yogurt, even honey! The package comes with an insert that outlines different recipes based on your skincare needs, so make sure to check that out! This is not your average toner. I actually stopped buying toners because I felt like they didn't really do anything for me, and I made my own (purified water with drops of tea tree oil) which worked fine but nothing exciting. This treatment mist claims to balance skin and minimize the appearance of pores. I love that this can actually be used by itself in place of lotion/moisturizer, but I'm way too into my skincare to skip those steps, haha! This product can also be used to refresh through out the day, and also as a setting spray after make up! I haven't used it throughout the day or after make up, but I mainly use it as my step after cleansing! As far as the pore minimizing effect, I can't say that it was super drastic and I couldn't tell as much as I can tell the hydration factor of this treatment mist. Also, the gorgeous smell of the neroli and rose doesn't hurt either ;) I can literally spray this mist on my face all day long but I'm trying to make it last as long as I can! Definitely going to try their other treatment mists! Okay. THIS is H A N D S D O W N my favorite! I've tried so many different things for my acne that has dried my skin and made it worse, but this - no dryness, no irritation. Now, my skin has come a longggggg waaaaay. I still get my breakouts especially that time of the month or when stress levels are through the roof (also when I'm not eating very clean, shh!). I used this everyday, morning and night and tend to concentrate on the areas where I breakout which is my T-zone, and especially my chin. It's a gentle way to battle those breakouts, but not less effective! There are other serums from Odacite that addresses breakouts, clogged pores, and scarring, so make sure to check them out! And not just for acne, but also for other skincare concerns too like dullness, redness, hyperpigmentation, wrinkles, and more! As mentioned earlier, I added a couple of drops to the Synergie Immediate Skin Perfecting Beauty Masque to add extra oomph to the detoxing and purifying properties of the mask. I'm so happy I got the chance to try two new products, and a tried and true one from Odacite. I've never experienced any irritation or problems with these products and it's awesome because my skin is usually picky when I put a new product on it. Again, the products are not miracle workers by any means (at least for me), but I know they will do wonders for my skin over time. I'll be definitely purchasing these products again once I've run out! I love skincare products that are natural and clean, but still provide results and Odacite is definitely a top on my skincare fave list! Leave me your name + e-mail address and I'll keep you updated! Don't worry, we won't share your info with anyone else! *Thank you to Odacite for sending the this gift! Happy Friday! Today, I'm going to be reviewing Medelita's Core One Tee. This review has been LONG OVER DUE so I'm very excited to share my thoughts with y'all. The Core One Tee by Medelita is not just an underscrub, but it's truly a tee that you can live in. I've actually only worn it once as an underscrub and loved it since it's thin and layers well. BUT what I actually LOVE wearing this for is: working out! Don't you just love double, even triple-duty items?! The tee looks sporty which is great because it doesn't look just like an underscrub - it really looks more like a workout top. I paired it with a printed Lululemon pant and it looked so great. TBH, I've worn it to the gym more than I wore it with scrubs. That's because as 2nd years, we didn't really have any reason to wear scrubs except for our occasional clinical skills lab. The material is super soft, and comfortable against my skin. I will warn you though, although it claims to be a sweat-wicking shirt my 'pit sweat showed through while I was working out (sorry y'all - just keepin' it real). My workouts generally get pretty sweaty though, so it might vary for other people. Besides that, I love the stitching detail that makes it acceptable as a workout top as well as the "m" in the lower left side on the back of the shirt. The fit is also very feminine and I love that! It has also held up very well during washings despite the thinner material - I always get worried because some shirts don't hold up well and get holes - NOT THIS ONE. Did I mention that it's pill-resistant AND wrinkle-resistant? BTW, I got this in an XS and it fits perfectly! What are your favorite underscrub brands? *Many thanks to Medelita for sending me this top to try out! Are We Friends Yet? Let's Stay In Touch! Leave me your name and email address & I'll keep you updated! Did you see my new tab where all the promo codes are? Click HERE. Hello to all my friends on this corner of the interwebs! I'm so excited to share and review this product with you all because: A. I love to workout, B. I've never come across a skincare line that specifically is for "sweaty skin". That definitely sparked the curiosity in me & I was so intrigued. First & foremost, I want to thank FRE for partnering with me so that I can review this product for you guys. Without further ado, here is my honest opinion about the 3 products from the 123FRE Set. The 123FRE Set includes the following: "Protect Me" (Sunscreen), "Purify Me" (Cleanser), and "Revive Me" (Serum). The idea is that you will use the sunscreen before your workout, especially if you're going to be exercising outside. After the workout, you will cleanse with the Purify Me cleanser. Lastly, you will rehydrate and rejuvenate your skin with the Revive Me serum. Let me just tell you all right off the bat, that I did not use the products in orders AND that I did not exclusively use these products. I added these products to my current skincare routine, really like a "supplemental" skincare. super-greasy facial sunscreens! This product claims to reduce premature aging, shields from UVA and UVB rays, combats photo-aging, and softens skin. Hopefully, with my continued use, I will prevent those things. (Let's be real though, your girl has been stuck in the libs, studying for boards). Now, this cleanser has definitely grown on me! I haven't used a beaded cleanser in a long time because I figured I would just exfoliate with my Clarisonic once in a blue moon. Or when I give my skin an extra scrub as I take off a mask that I would do every two weeks, if that. But boy, does my face need some exfoliation. Since I sweat (a lot) when I work out AND yes, I work out with a full face of make-up on (so bad for the skin TBH, but I'm so guilty), my skin needs the extra exfoliating action. The beads in this cleanser are so fine that it provides just the right amount of "scrub-factor". Another thing I love about this cleanser is that it did not strip my skin of moisture. That tight-skin feeling after cleansing is such a HUGE pet peeve of mine because "why should a cleanser deplete my skin of moisture?!". This product claims to restore the natural pH balance of skin, unclog pores, prevent breakouts & irritation, hydrate and nourish skin. As I said, this cleanser delivered a lot (more than I was expecting). I tend to only use this after workouts - so at night time. BUT as I mentioned needing the extra exfoliation, I will be using it more often (probably every night). In the mornings I use a non-exfoliating cleanser. Last but not the least, is this serum. This one is MY ABSOLUTE FAVORITE out of the set. I love it so much that I use it morning and night - it's definitely earned a spot in my current skin care routine! It's so hydrating and my skin just feels so soft when I wake up in the morning. This literally revives my skin haha! (Okay, sorry for being dramatic - this one really is my fave). You only really need a tiny amount (pea-sized) and it goes such a long way. This product claims to regenerate collagen & elasticity, anti-aging, anti-wrinkle, replenish lost vitamins and minerals (from sweating), improves skin firmness and density. I can't accurately asses all of these right now as I've only been using it for a month and a half, but I feel like with continued use it will definitely prevent the wrinkles and aging and improve elasticity. Of course, it's not a miracle product by any means, but I believe that it's going to be a great asset to anyone's skincare routine! FRE Skincare is a completely vegan skincare line, which is great for all my vegan babes out there! Also, this is not just for those who workout. It's also for ladies who love to spend time outdoors, under the sun - It doesn't matter the way you sweat! I mean, let's be real: if you're a skincare junkie and want to try out new products, go for it! All of FRE's products are based on an Argania Active Complex. It's not merely just argan oil, but FRE uses argan stem cells. It's supposed to have more benefits for the skin than just the oil. Check this page out for all the benefits of the ingredients they use, and how their product targets the different effects of exercising, sweating, and sun-damage: Click Here. Also, I will mention that this is NOT an anti-acne product. There is definitely a benefit of preventing acne from using this, but it's not necessarily formulated for that purpose. Just an FYI, if you're looking for more of an acne treatment. I will say though, that if your acne is more due to lack of washing your face after a sweaty workout or being outdoors this may work for you! (*Just my own opinion). I've enjoyed incorporating these products into my skincare routine. Not only that, but it has encouraged me to be more aware about wearing SPF, even if I'm indoors most of the time. My skincare routine is definitely pretty hefty, and I'm not very good at sticking to only three products. So, these will continue to be incorporated into in my routine especially since I workout pretty often throughout the week. Also, I just love switching it up sometimes when it comes to skincare (#skincarejunkie). But if you're a minimalist, I'd say this is a pretty solid set! The serum nearly acts as both a treatment and moisturizer, and you can pop the sunscreen right on top! The cleanser is gentle enough (even with the exfoliating beads) that you can possibly use it morning and night if you so choose. This discount code can be used multiple times, and feel free to share it! Last thing: If you do give this set, or any of the products a try, I would LOVE to hear your thoughts! As always, thank you for reading & your continued support. Talk with you all soon! ITS FRI-YAY! How's everyone's week been? I cannot believe that there's only about three weeks left of classroom work, then we hit the ground running with dedicated board-studying time. Time really flies when you're having fun... or working hard. HAHA. 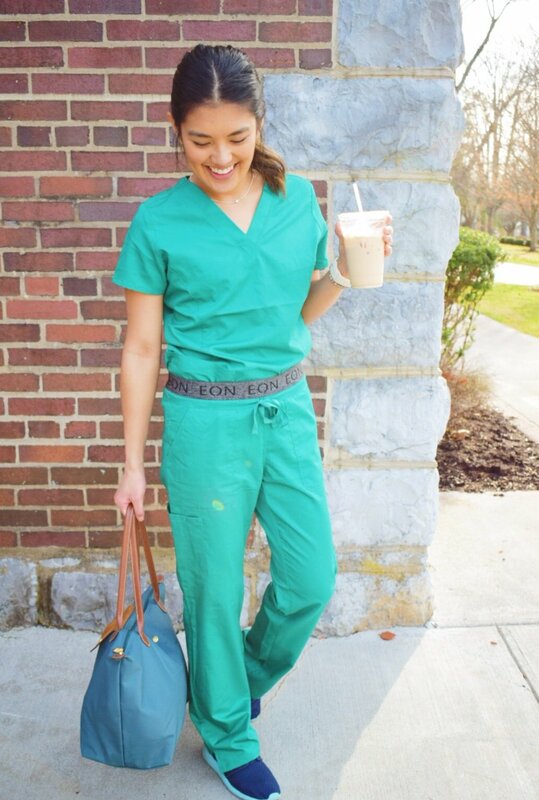 Today, I'm very excited to share with y'all two pairs of scrubs that Maevn Scrubs gifted me (thank you, Maevn!) in order to review. 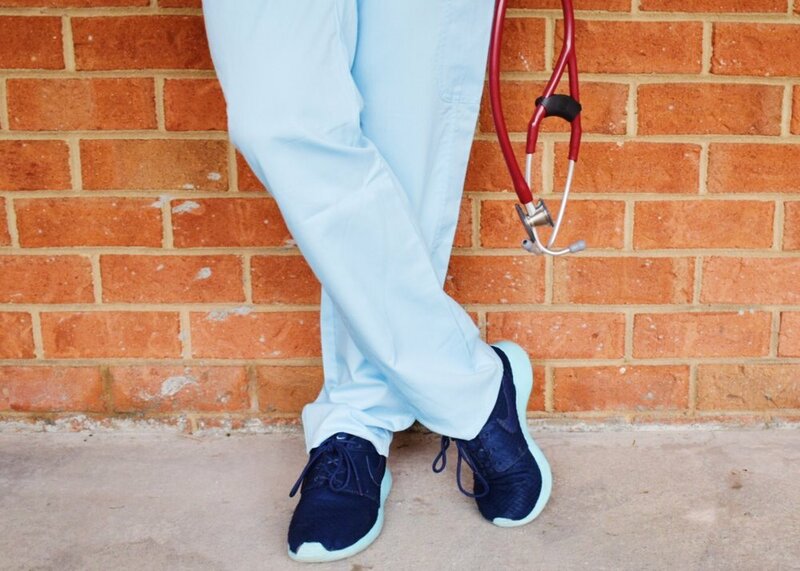 Both pairs are part of their EON/EON Active Brand, which is made of a more technical fabric, so it truly feels like you're wearing more of a work-out clothing than scrubs. And if you know me, you know I love wearing workout clothes. The First one I'd like to share is this Hunter Green-colored pair. I'm in love with this color. It's gorgeous! The color is definitely a lighter green, but still very pretty & vibrant. (Here are the links: Top. Bottom.) The top has got A LOT of pockets which is awesome & it even has a triangle ring - which I haven't had a reason to use yet - that I'm sure will come in handy at some point. The fit was also really great because it was not baggy on my and it actually has a shape. Did I mention it also has side vents for when you know, you get sweaty? As for the pants, I'm 5'2" and THEY FIT! Not too long and not too short. I got it in a XS Regular (both top and bottom). And I think my favorite thing about them is the waistband. You not only get the waistband, but also the drawstring! I'm not really a fan of the scrubs that stay up only if you tie the drawstring SUUUPER tight, only to get loose again. So if I had the option, I would definitlely opt for something like these! I also love the tapered fit, so it looks clean and not baggy. Y O G A ! ! ! Okay I got way too excited, but uhm these are so comfy too. As always, Maevn does not skimp on the pockets, which always ends up with something in them, haha! These ones don't have a drawstring though so if that's something you're looking for I suggest the ones above (but they also have other styles with drawstrings). But the waistband on these are like those of workout pants, and it's nice because it doesn't dig in, especially when you're sitting. So you're sure to be comfortable throughout your long study hours, work shifts, or even yoga if you choose to do some downward dogs in them! Lastly, these pants also have a tapered fit - so no baggy scrubs here. (More details about the pants here). I'm so excited to be able to use these for 3rd and 4th year for all the times I'm going to be wearing scrubs (which I'm sure is many times). The GREAT NEWS is that Maevn Uniforms are giving away 1000 to healthcare professionals, students, etc FOR FREE! This giveaway is on Instagram and Facebook and here are the instructions, which I will also post on my IG @_dorothyfaye. 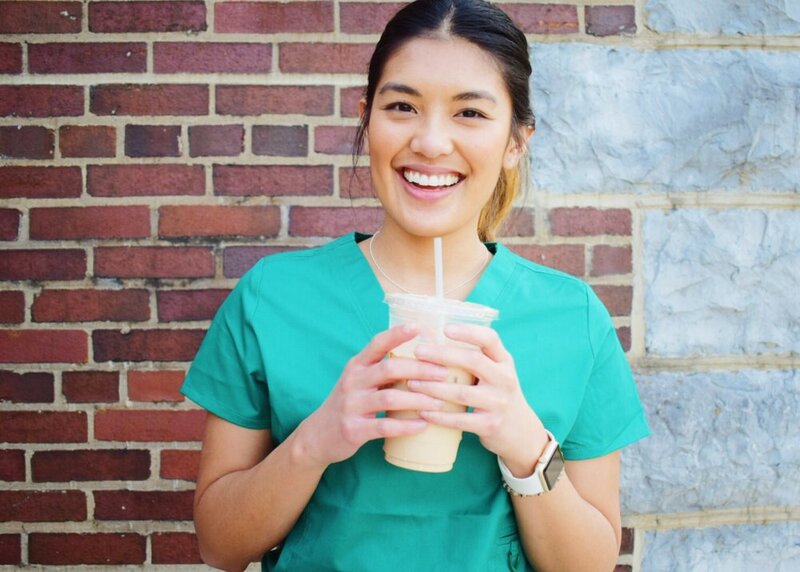 The first 1000 eligible entries will receive a FREE pair of Maevn Scrubs of their choice (PS. Shipping is FREE too!). I hope you all have a wonderful weekend & thank you for stopping by to check these scrubs out! Disclaimer: The giveaway is hosted by Maevn Uniforms! Thank you again, Maevn Uniforms for letting me review these scrubs. All opinions are solely mine. Happy Friday! 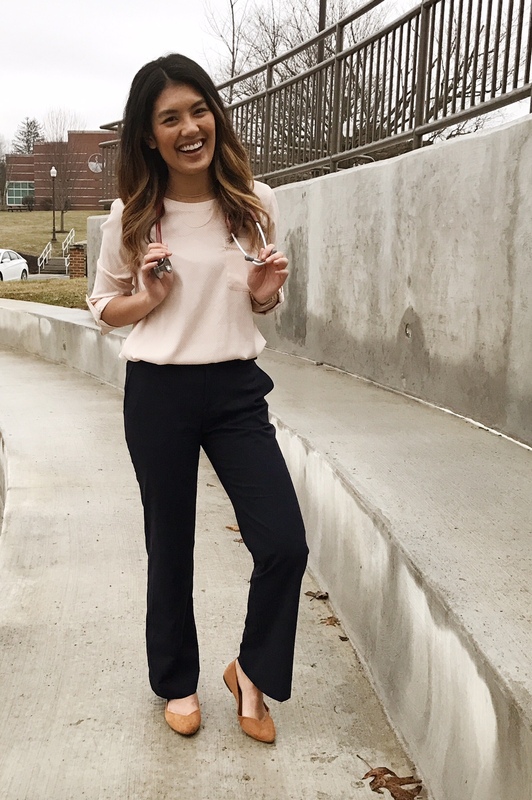 Today I'll be sharing how I changed up the look of one of my favorite pants from Banana Republic. I've had OMT Clinic and standardized patient encounters back-to-back (Wednesday - Thursday) so I've been loving pairing these pants with different tops. Okay - I can't be the only one that wears pants twice right? 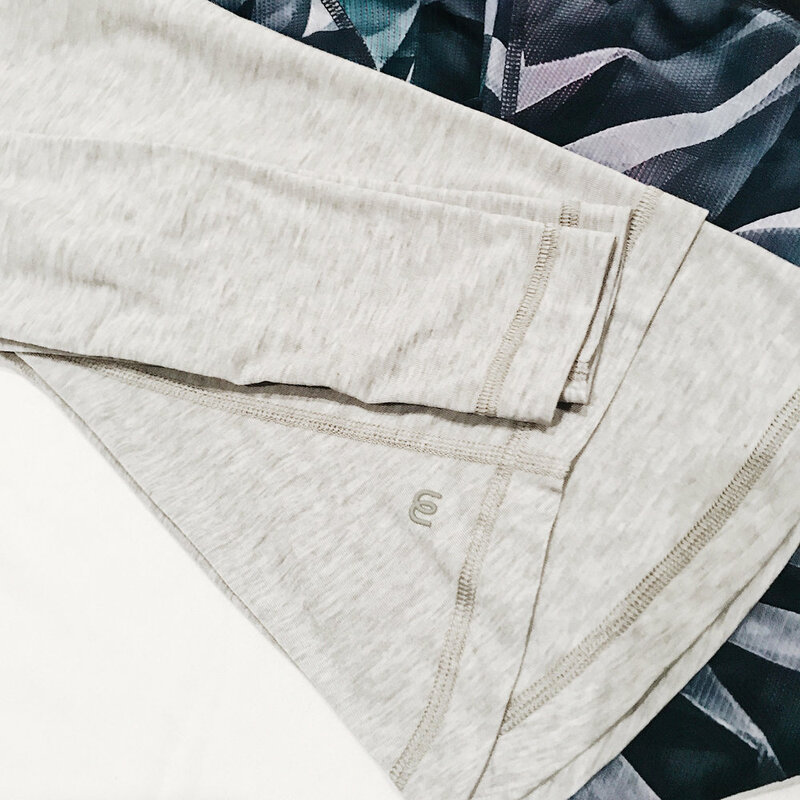 I change out of my business casual clothes right away because I love being comfy in my leggings - who else is with me? The looks might seem similar to some of you, but I think changing up the color of my top gives a completely different look (in my opinion). 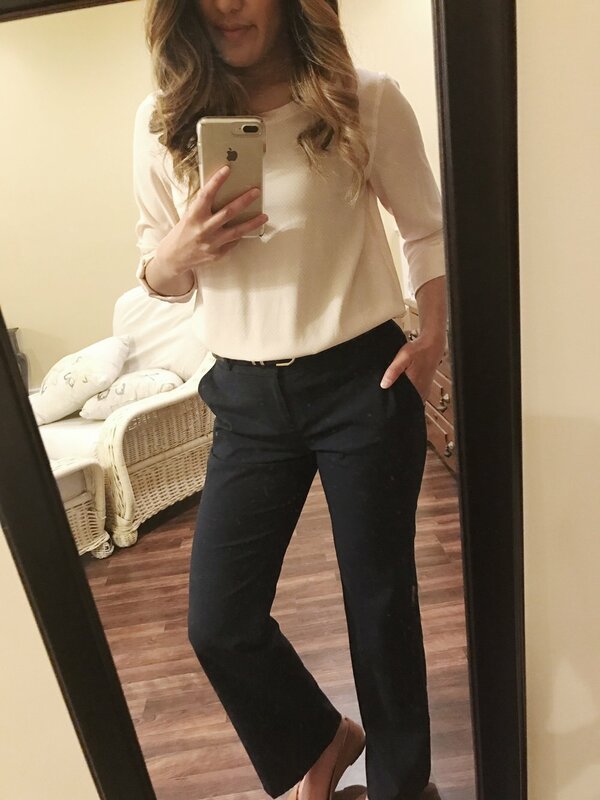 Side note: The pink blouse and navy pants was what I wore to my interview at my medical school! (Plus a the matching blazer + black low-height heels). The top you see above is from Ann Taylor and the pants are from BR (like mentioned above) - the Martin Fit. I love the combination of the soft pink and navy blue and how the colors are contrasting. I tend to not wear both dark colors for top and bottom. Also, I tend to stick with solid tops but this one has some small polka dots on it. It's hard to see in the picture but in person it's a very cute and dainty detail. My shoes are from Old Navy - they're not the MOST comfortable in terms of the foot bed, but I can't complain because they don't give me blisters! Lastly, I'm wearing the Chain of Hope necklace from Benevolence LA. This second outfit is one of my favorite outfits. I always tell myself "OKAY - you wear too much blue" but I CANNOT help it. I love a good blue outfit - like a light chambray top and dark-wash skinnies AHHH! So this is like a translation of that, but more professional haha! The top is the only thing that changed and it's from The Limited. The necklace is from Benevolence LA and I'm loving the opal with the blue tones of the outfit. You can't see the belt in the first picture as much, but it's a black patent leather belt with gold hardware from BR. The gold hardware on it is probably my fave!